The Mini 4 Piece Ergo Grinder 43mm is constructed from aircraft grade anodized aluminum for maximum durability, leaving you with a tough as nails grinder that easily resists scratches, scuffs and smudges. The 4 piece grinder includes a removable stainless steel sifting screen for quick cleanings, a magnetically sealed top lip to avoid spills, and a bottom storage compartment for collecting the fine pieces of pollen that fall from your grinded blends and spices. On the lid of the Ergo is a grip design that makes grinding your material extra easy, as it has micro-ribbed edges that require little to no torque to fully shred through even the most dense material. 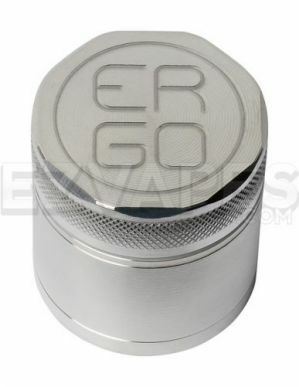 Ergo shows full confidence in their products by backing each and everyone with a lifetime guarantee, ensuring you new Ergo grinder will stand tall against the test of time and perform like new for years to come. The mini size is 43mm (about 1.75") making it a great portable size.